Leadership is responsible for severely low worldwide employee engagement. Gallup has monitored performance in organizations and measured the engagement of 27 million employees and more than 2.5 million work units over the past two decades. Managers are the reason for at least 70% of the low employee engagement scores across business units, Gallup estimates. Harvard Business Review studies find that particularly senior executives display an unwillingness to think rigorously about innovating their world perspectives and their ideas of how organizations are managed and transformed. Which poses an inbuilt risk for hampering employee resource development and commitment to utilize the infinite, risk demanding opportunities of the 4th Industrial Revolution. Startling, over the past 12 years, these low numbers have barely budged, meaning that the vast majority of employees worldwide are failing to develop and contribute through work – due to unfulfilling leadership. STATUS QUO– the majority of employees worldwide fail to develop their full potential and do not contribute optimally – which demotivates. If in our high-tech era we succeed in innovating leadership – that mobilize people’s potential – we can expand the capacity for innovation – FREE OF CHARGE. Research over the past 20 years has shown that max. 20% of organizations – that initiate change processes – succeeded in completing profound transformations – the foundation for long-term success. IF YOU STRIVE TO ADAPT TO THE TRANSFORMATIONS OF I4.0 – YOU MUST HAVE THE WILL TO ENDURE. YOU HAVE NOT ACOMPLISHED WHAT YOU SET OUT TO DO – UNTIL YOU HAVE REALIZED IT. YOU MUST ADAPT AND INNOVATE YOURSELF – THROUGH FOCUSING ON WHAT YOU WANT IN THE LONGER RUN. NO MATTER WHAT IT TAKES – NO MATTER HOW LONG IT TAKES – NO MATTER HOW MUCH YOU MUST ADAPT AND LET GO OF PRECONCEIVED PLANS AND CONCEPTS – NO MATTER HOW YOU MUST TRANSFORM. NeuroLeadership – Just do it! Transformations are mobilized through innovating mission with meaningful purposes. Expansive transformation processes are chaotic and without guarantees and require leaders who have insight into the human psyche. Idealistic missions – involving those who have to deliver the working hours – mobilizes people’s motivation to invest in performing in alignment with the company mission. CORE PURPOSE makes it possible to pursue – what we strive for in the future. In spite of – that fundamental adaptations takes longer than we want to acknowledge – when we venture into the unknown. Do you MOBILIZE beyond Status Quo? FUTURIZE THE EVEREST WAY – A person who wants to lead into the future must create a self-governing organization through a mobilizing mission statement. Our complex reality requires that we renew and transform leadership to expand employees capabilities to innovate ground-breaking results in I4.0. Why not use the hard facts of Neuroscience to advance leadership innovation? NEUROLEADERSHIP disciplines the mental strategies that mobilize leaders, organizations and individuals to be co-creators for the future. NEUROLEADERSHIP affects deep-rooted habits that tends to disrupt the genuine transformation we are all confronted with in I4.0. Mental re-programming through NEUROLEADERSHIP supports long lasting behaviour change. THE LEADERS who develops companies that lead into the future – must acquire cutting-edge research-based mental tools to advance leadership effectively. MISSION MOBILIZED Human Innovation begins with unorthodox – innovative reflections about the company raison d’etre. Thoughts that identify THE core purpose. Then develop your company Mission. The wise leader who innovate dedicated employees – who led for the Future in I4.0 – acquire understanding of neuroscience as a basic insight in how peoples minds work. Because NEUROLEADERSHIP – relates to leading change at any scale in any market. NEUROLEADERSHIP is simple focus on a compelling mission as well as adhering to the company core ideology until you have realized the bold stretched goals – THE ENVISIONED FUTURE that has never been accomplished before. We can INNOVATE the future – one brain at THE time! HOW CAN we program our brain to INNOVATE? One of the most important research FOUNDED development & BEHAVIOUR CHANGE insights in our decade is NEUROLEADERSHIP. NEURO PROGRAMMING – Articulate THE MISSION – Human Innovation starts with innovative thoughts. YOU SHOULD INNOVATE A SIMPLE SLOGAN – YOU CAN REPEAT OVER AND OVER AGAIN – WHENEVER YOUR HABITUAL WAY OF THINKING AND ACTING THREATENS TO DISRUPT YOUR NOVEL OBJECTIVES. FOCUS on your MISSION – Repeat your MISSION STATEMENT. Program your brain and your organization for long term expansion. Objectives that are repeated – stimulate the formation of new brain synapses that strengthens capacities to expand in novel directions. Now fanged focus weakens the habitual behaviour patterns. Overrule mental habits – that sustains Status Quo. RE-Program by repeating the mission statement slogan. YOU SHOULD FOLLOW THROUGH ON YOUR OBJECTIVES BY DISCIPLINING NEW THINKING AND ACTIONS. THE CORE PURPOSE MUST BE A RAISON D’ETRE. THAT DETERMINES ACTIONS – MOBILIZES ALTERING GOALS AND STRATEGIES. THE CORE IDEOLOGY MUST SUSTAIN THE MISSION AT ALL TIMES . YOU MUST KEEP GOING AND DO WHATEVER IT TAKES – AGAIN AND AGAIN AND AGAIN. REPETITIVE COMMITMENT – WILL BE NEEDED AS ALL MISSIONS ENCOUNTER ENDLESS SETBACKS AND DERAILING OBSTRUCTIONS – FROM CHANGING MARKET CONDITIONS TO OLD HABITS THAT DIE HARD – IN THE PEOPLE YOU NEED TO INNOVATE RESULTS. AS WELL AS IN YOURSELF..
Just do it AND Keep doing it - till it works! THE EVEREST WAY is one of the world’s most efficient change methods. THE EVEREST WAY is for anyone who wants MORE. Or is forced to adapt by contemporary upheavals. THE EVEREST WAY gives you a project and process model, as well as mental strategies that have been tested on extreme and varied goals. No theory – HANDS-ON results. Clear focus – the will to suffer and endurance – are just some of the messages that give insights the audience never forget. THE EVEREST WAY creates extraordinary measurable results. In individual people and throughout – Global companies. THE EVEREST WAY gives responsibility for the future to the people who will live with the consequences. And it revitalizes – and installs collaboration – also across cultures and borders. NEURO LEADERS SHIP is targeted to the entire organization from bottom to top management and boards. The greater the innovative capacity the individual develops – the more we can invent. When a human is expanding the brain’s capacity, it can create new growth without additional costs. When every individual in entire organizations – expands their brain capacity, that really transforms the prospects! 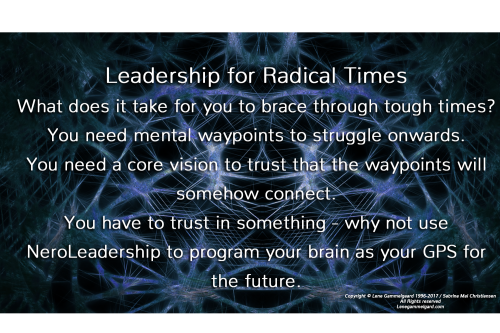 NEUROLEADERSHIP is also crucial to HUMANIZE when WE FUTURIZE. That we all focus on the Greater Good for HUMANKIND in the 4 Industriel Revolution. This presentation provides mental tools that ensure expansion in and of the individual in any market and Trend. Understand why the brain “helps us” – when we have a clear focus projected into the Future. NEURO LEADERSHIP is an ingenious proposition for launching innovative initiatives. As well as transform outward disruptions to future success. Futurize yourself and your organisation. Riskwillingness is the prerequisite for innovation & futurization. Are you & your business – committed to improving the state of the world? DECENCY LEADERSHIP is for everyone who dares, YOU who are creators of a common future for the Greater Good of Humanity. To ALL – striving for a future worth living. TO LEADERS, who really WILL look into the future. Maybe naive ??? But there is growing focus and demand for social responsibility, fair trade, sustainability in the utmost sense. We navigate in a matrix shift – from hyper consumerism towards decency in our approach to shaping business and society. So, even though DECENCY LEADERSHIP perhaps initially sounds naive and long-term – it’s the recipe – that we will survive in the future. Funny, it’s also DECENCY – most employees are looking for in a leader …..
ARE YOU IN THE WORLD TO CHANGE IT? HUMANIZE WHEN WE FUTURIZE. We live in a technological stampeed – to utilize the 4 Industriel Revolution to the advantage of HUMANS, we must strengthen the individual to choose not lose. HUMAN INNOVATION – LIKE NEVER BEFORE is for whole organizations, teams, any group of people who strive beyond STATUS QUO. This KEYNOTE is both a mental recipe for inventing towards the future we dream about. And the recipe for how we adapt to the rapidly changing era – without existential fear of what to expect. This presentation is aimed at mobilizing and supporting organizational transformation processes where ALL participation is a prerequisite for success. Requested WORLDWide as this KEYNOTE mobilizes renewed hope, self-responsibility and continuous fighting spirit.